Last Thursday demolition of 46 Rowland Street Kew was stayed by Planning Minister Matthew Guy with an "Interim Protection Order for the birthplace of Australia’s 21st Prime Minister, the late Gough Whitlam". Before the notice was posted, flowers were placed on the fence plus a tribute from an anonymous donor which speaks for many, reproduced above. Mayor Coral Ross sent this to me and said to circulate it as it is a public document. In my view it is first class and should be of interest to many. See the listing of 46 Rowland Street Kew Vic 3101 on realestate.com.au http://www.realestate.com.au/property-house-vic-kew-115438563 What monstrous vandalism to demolish this house and garden for what undoubtedly was planned to be a wall to wall Mc Mansion. Thanks Vita for alerting us. The Economics Committee of the House of Representatives have delayed its report on foreign ownership of residential real estate, originally scheduled for release on 10 October 2014, now due sometime in November. There were a number of articles in yesterday's Australian Financial Review. It appears that information about the approvals system in Australia for foreign purchases of residential real estate has been leaking out in a positive flood. Speculation is that the committee report might be a whitewash but it is obvious that the issue is very serious. 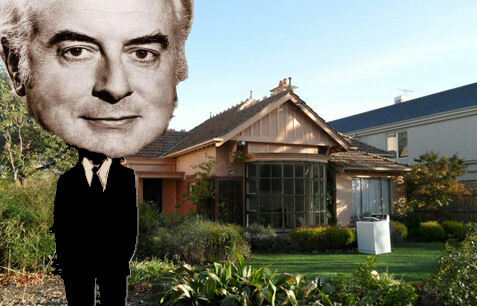 On Saturday afternoon, yesterday, a Channel 9 news crew were at 46 Rowland Street Kew at Gough Whitlam's house. They said that they were preparing for a film on the above subject but were not sure when it would appear - maybe after the news on Monday 27 October 2014 - tomorrow. 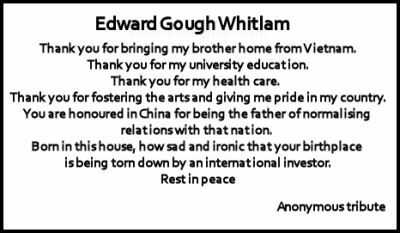 Ironically the casual disrespect shown to Gough Whitlam's birthplace by the NFIRB and Melbourne planning has provided Victorians with their first opportunity since the Dismissal to show how much they were offended by it and how much they appreciated and cared for Gough Whitlam. Because our society is so atomised by big business and so artfully misrepresented by our monopoly press, we lack free public forums and networks whereby we can spontaneously unite to express our opinions. Instead we are usually confined to sitting in front of televisions listening to self-important talking heads give their views or reading accounts in the press of what our opinions are supposed to be. Now we find out that, not only did many of us care about Whitlam, but we still care and he is remembered and appreciated far more than any other primeminister in this country because he was the last to stand up for the very things that his successors have so shamefully sold off and destroyed. Yes, it is indeed fascinating to realise that the policies of the Foreign Investment Review Board that invite overpopulation and wasteful destruction of established buildings, might have remained unsuspected by most Australians, if Gough Whitlam had not died just before the scheduled demolition of his birthplace by a foreign purchaser. How inconvenient for the planners and the NFIRB and how convenient for democracy and the rest of us. It is as if Gough Whitlam, a primeminister who sought to reform urban and regional development by offering the people an alternative to private land speculators and to preserve Australian assets from globalisation, is having the final word. AUSTRALIA’s investment authorities are investigating a fraction of the more than 5000 foreign purchases of established homes over the past nine months despite widespread concern that current regulations are either inadequately enforced or widely flouted. Treasury says it is investigating 33 cases where a foreigner has purchased an established home — which is banned in all but a narrow range of circumstances — including several “high value” purchases. The figure amounts to less than 1 per cent of the more than 5000 foreign purchases of established homes since March. It is unlikely to alleviate the pressure on the Foreign Investment Review Board from MPs and renters to boost its lax enforcement efforts amid soaring real estate prices. The Australian revealed ­recently that the FIRB, which sits within Treasury, has not prosecuted a single foreign investor for an illegal purchase since 2010. Treasury’s submission in ­response to a committee of MPs pushing for better enforcement of FIRB rules cites three examples of prosecutions it has led, but the most recent case date back to 2006. The only situation in which foreigners can purchase established homes here is if they are temporarily residing in Australia, and even then, the property must be sold within three months of the buyer returning to their homeland. As The Australian has revealed this loophole is being exploited by wealthy foreigners looking to park cash in the Australian housing market. In many cases they are using their children studying in Australia, or lawyers or other service providers, as investor proxies. The latest figures from the FIRB show that foreign investors have doubled their purchases of Australian property in just one year with 5755 homes worth $5.5 billion bought in the nine months to March alone. More than 100 agencies are ­active in China openly marketing Australian established housing even though would-be buyers would almost certainly be breaking the law. I would not be able to buy property in China, Sri Lanka with 100% tax on foreign freehold purchases, Thailand and Singapore generally prohibited with strict limitations, Indonesia prohibited and many emerging economies requiring citizenship. I am not suggesting no foreign investment, but a more thorough testing of foreign buyers and purchases and a toughening of regulations by the Foreign Investment Review Board. The Executive Members., Foreign Investment Review Board, Canberra. To introduce more thorough testing of foreign buyers and their purchases; rigorously scrutinizing every purchase for irregularities and requesting the toughening of regulations surrounding Foreign Investment of ALL Property Types in Australia by the Foreign Investment Review Board. I've signed, and I encourage everyone else to do the same, and pass the link on. It is a shame that no political party is suggesting that politicians should be put to trial for this act against their country. I certainly believe this sort of action warrants putting people in the dock. 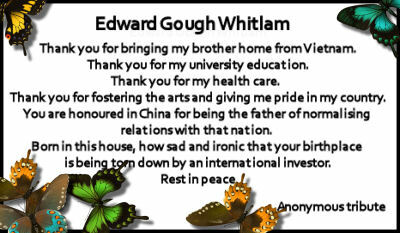 The following was posted to a discussion about Gough Whitlam on johnquiggin.com. Gough's attempt to introduce free tertiary education was rolled back by subsequent 'Labor' and Liberal governments to the point where a perverse debt collection industry based on buying and selling debts that students incur attending university has been established in Australia as has alo occurred in the UK and other places. Syria, in the midst of wars and a terrorist insurgency, is able to provide free tertiary education to all its citizens as I showed on October 26th, 2014 at 23:29. If Syria can do it, why can't Australia, the US and the UK? Clearly this suggests that Gough was right to attempt to make University eduction free. The other obvious link is that Bashar is, like Gough was, the target of an attempted US 'regime change' Unlike Gough, Bashar has been more successful in stopping foreign powers meddling in his country's domestic affairs.